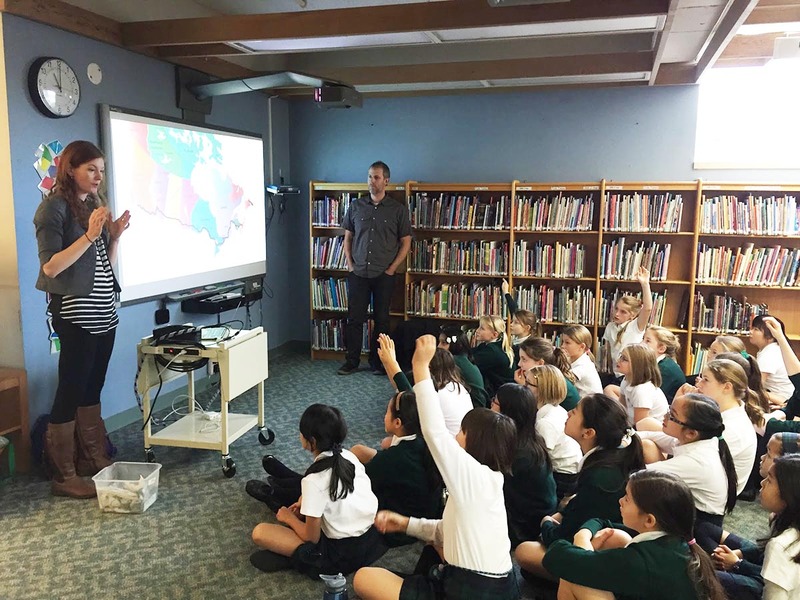 Documentary Filmmakers Jen and Grant with Grade 5 girls. 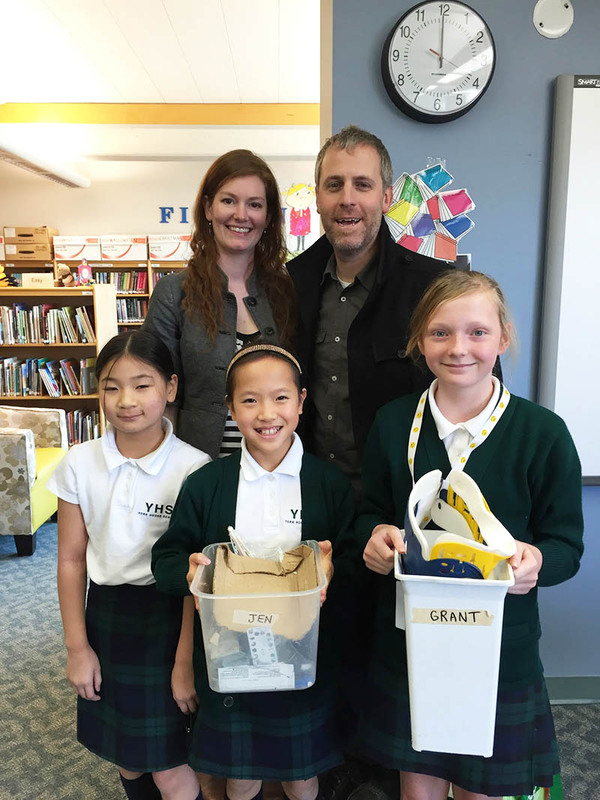 Grade 5 students were truly inspired by a visit and presentation from local, award-winning documentary filmmakers Jen and Grant who made The Clean Bin Project. The girls watched the movie prior to the visit as part of their inquiry into sustainability. They had many questions for the guests about the motivation to live for a whole year garbage-free, the challenges of not buying anything and what they learned from the experience. For example, a plastic fork that is used for about 10 minutes takes over 500 years to decompose. Grant shared that one crazy idea can have a huge ripple effect on how you continue to live your life and how people around start to change their behaviours. Students reflected on how their thinking about garbage and plastic was transformed by this exposure. Jen and Grant present to the Grade 5s. We are excited to watch Jen and Grant’s next endeavour, the film Just Eat It – A Food Waste Story. Apparently 40% of our grown food is thrown away in perfectly edible condition while one in nine people do not have enough to eat in Canada. Jen and Grant ate discarded food for six months, spent only $200 dollars and even gained 10 lbs ! Thank you to Mrs. Martin for arranging this authentic learning opportunity. 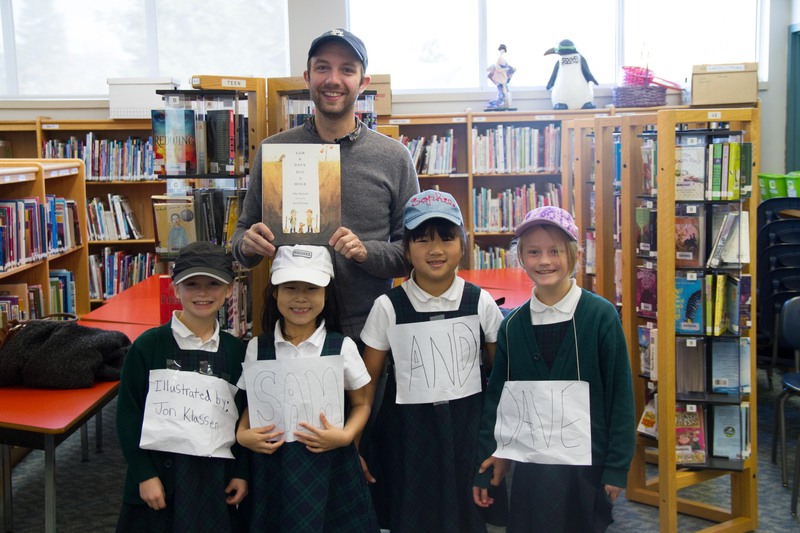 “Authorstrator” Jon Klassen arrived at our school last Thursday morning wearing his signature hat! Jon was on a North American tour to promote his newest book Sam and Dave Dig a Hole. View a promotional video here. The Grade 2 girls enjoyed a rollicking session as Jon read his award winning hat books: I Want My Hat Back and That’s Not My Hat. Many of the girls wore hats to add to the fun. And a few girls honoured Jon’s visit with hand printed signs for his newest book. The girls learned about the dual process of writing and illustrating a picturebook. Jon’s simple artwork came alive when he demonstrated how the placement of the eyes on an animal can evoke emotion. His characters have no mouths so can’t talk. The text represents their thinking (watch the video below). Books for the girls were signed and personalized with a special JK illustration. The JS library also received an original image drawn by Jon especially for us!